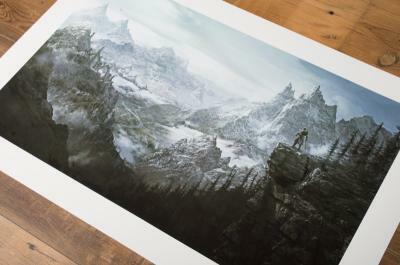 Next-gen art gallery Cook & Becker in conjunction with Bethesda Softworks announced the release of a series of official Certified Art Giclee prints from the award-winning video game, The Elder Scrolls V: Skyrim. The official Skyrim fine art collection is now available worldwide via Cook & Becker’s online gallery and store: www.candb.com. The collection consists of 18 prints of concept and production art used in the development of Skyrim. Many of these pieces come from Bethesda Game Studio’s senior concept artist Ray Lederer, and show off early depictions of now iconic landmarks, creatures, and characters from the game. With art ranging from environment studies, to sketches of the Dragonborn, and from enemy designs to a concept painting of the game’s epic dragons, this collection is sure to be a feast of recognition for fans of the game. Each print is hand-numbered, and most works come with a Certificate of Authenticity signed by artist Ray Lederer. The prints are available unframed or with a high-end finish or frame.